Get your free, 3-month access to web monitoring. 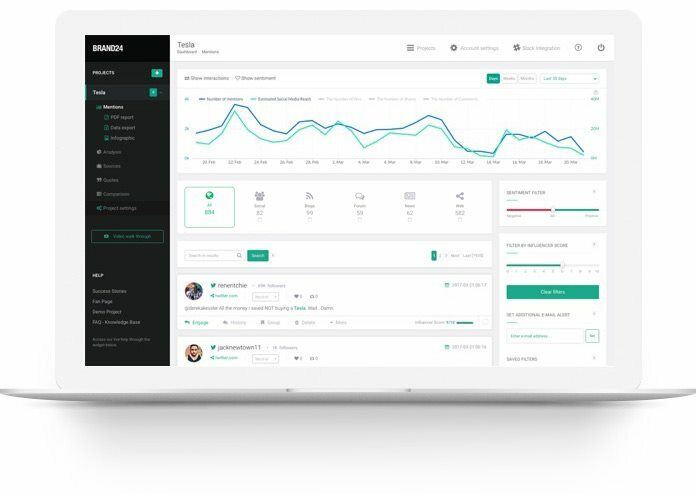 Track your social mentions, monitor marketing campaigns and find customer leads. Discover​ ​what​ ​people​ ​are​ ​saying​ ​online​ ​about​ ​your​ ​brand​ ​-​ ​as​ ​it​ ​unfolds​ ​in​ ​real​ ​time.​ ​Brand24 gives​ ​you​ ​instant​ ​access​ ​to​ ​mentions​ ​about​ ​your​ ​brand​ ​across​ ​the​ ​web,​ ​from​ ​social​ ​networks to​ ​influential​ ​publishers. 80%​ ​of​ ​consumers​ ​do​ ​research​ ​or​ ​ask​ ​online​ ​before​ ​making​ ​a​ ​buying​ ​decision.​ ​Brand24 gives​ ​you​ ​the​ ​listening​ ​tools​ ​to​ ​find​ ​these​ ​leads,​ ​identify​ ​where​ ​to​ ​promote​ ​products​ ​and​ ​find customers​ ​before​ ​they​ ​find​ ​you. Identify​ ​people​ ​with​ ​the​ ​most​ ​social​ ​influence​ ​and​ ​made​ ​them​ ​your​ ​brand​ ​ambassadors. Easily​ ​segment​ ​by​ ​positive,​ ​negative,​ ​or​ ​neutral​ ​mentions. Use​ ​our​ ​powerful​ ​Excel​ ​Reports​ ​to​ ​download​ ​raw​ ​data​ ​for​ ​further​ ​analysis​ ​and​ ​brand​ ​your own​ ​beautiful,​ ​customized​ ​PDF​ ​Reports. Analyse​ ​collected​ ​data​ ​in​ ​terms​ ​of​ ​a​ ​number​ ​of​ ​mentions,​ ​estimated​ ​social​ ​media​ ​reach​ ​and interactions​ ​typical​ ​for​ ​social​ ​media​ ​such​ ​as​ ​likes,​ ​comments​ ​and​ ​shares. Leverage​ ​our​ ​practical​ ​dashboard​ ​to​ ​browse,​ ​filter,​ ​&​ ​analyze​ ​posts.​ ​Search​ ​through​ ​the noise​ ​to​ ​find​ ​the​ ​posts​ ​that​ ​matter​ ​the​ ​most.​ ​Access​ ​our​ ​built-in​ ​influence​ ​filters,​ ​sentiment filters,​ ​and​ ​much​ ​more! Start hacking your brand and get instant access to mentions!